I bought these medals yesterday from Elsecar Antiques at the Heritage Centre at Elsecar, I was supposed to be visiting the Craft Fair, but I got side tracked! My paternal grandfather left an old tin box with his souvenirs of WW2, a collection of German military badges, various British cap badges and his own medals. My maternal grandfather served in the Home Guard, I have a photo of him in uniform and I know he was awarded the Defence Medal, which I don't have. Apart from that I don't own any family wartime memorabilia. I do talks, history talks, talks to groups and schools, talks for a fee (or a donation), you can download one of my leaflets here. In the past few years I have come to understand that it is easier to talk about history to some groups if you actually have something they can handle, or look at, which prompts conversation and questions. 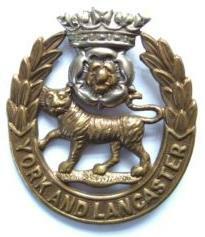 I bought a York and Lancaster cap badge in Newark Antiques Centre when on an outing with my mum a couple of years ago. It has since come to feature on many soldiers' stories on Lives of the First World War, where I am Remembering hundreds of local servicemen, when I can't find a photograph of a man. The Barnsley Pals (13th and 14th Battalions of the York and Lancaster Regiment) were just a few of the York and Lancaster battalions in WW1 in which Barnsley men enlisted. Similarly the contents of my grandfather's tin box have come in handy for the same purpose to illustrate men from many other regiments. We often see fuzzy images of these badges on soldiers' caps and people have asked me to identify which regiment a man was in. It's not my specialty, but I am interested. Some soldiers served in more than one regiment during WW1 so identifying a badge can date a photo and locate a man in a particular place. Visitors have brought their own relatives' cap badges and medals to my talks - they are rightly very proud of them and have often paid for them to be professionally mounted so they can be displayed. This is very helpful for me and alllows the rest of my audience to see actual medals, often prompting memories and further questions. Now I have my own set I will carry them around with my prized cap badges to more of my talks. I have discovered that there is a limited understanding amongst much of my audience about what the medals actually mean, who was entitled to them and the differences between them. This Wikipedia page and this page on the Long, Long Trail website are particularly good reference material and I have used them as resources for the comments below. Not every man who served in the First World War was entitled to a medal. If a man did not serve overseas in WW1 (it was different in WW2) he would not have any medals. 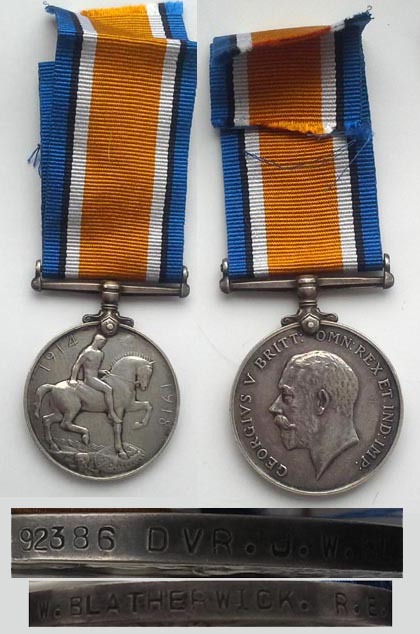 The most commonly issued medal was the British War Medal. Any man from the British Empire who left his native land was entitled to one of these even if he did not enter a Theatre of War - that is somewhere with active combat. My medal belonged to John W Blatherwick, who was born in 1889 in Newark. He had enlisted in the Royal Engineers at Nottingham in October 1915 leaving a wife and four children at home. Prior to the war he had been a carter for the Corporation, so unsurprisingly he became a Driver. I imagine his job was fairly safe, but Salonika, where he was posted from 1917 to 1919 was a Theatre of War all the same. John unfortunately managed to pick up malaria along the way which contributed to a 20% disability, according to his discharge documents, and entitled him to a very small pension when he got home. John and his wife Lydia had ten children in all, but four died in infancy. I wonder if his malaria contributed to his, maybe by limiting his employment options during the 1920s when three babies in a row died shortly after birth. You can find out more about John Blatherwick or add to his story yourself on Lives of the First World War. I will get a notification if anyone, family member or another historian, posts on any post I have created, here or on Lives, and it would be nice to find out what happened to John and why his medal was sold. The Long, Long Trail tells us that many soldiers pawned or sold their British War Medals as, due to the silver content, they were the most valuable. Is this why John's BWM was in a cabinet in Elsecar Antiques? John would also have been entitled to the Victory Medal, but there was no sign of that in the cabinet. The second medal I bought was a Victory Medal which had belonged to Herbert Purkis. The Victory Medal was awarded to all men who entered a Theatre of War. 5,725,000 Victory medals were issued compared to 6,610,000 British War Medals. When worn together these two medals were tagged "Mutt and Jeff" by servicemen, after contemporary cartoon characters. I have not been able to identify Herbert Purkis yet. He was an Acting Corporal in the Royal Engineers and purely by his name I have whittled down the options to three or four men in either Hampshire, Cambridgeshire or London. He did not die in the war and no other military records survive for him aside from his medal card and medal roll. I have added this image of his medals to his Lives of the First World War page and I hope that someone will add to it in time and help Remember Herbert. Again, it would be nice to know what happened to him and why his medal was sold. The final medal I bought is a 1914/15 Star. This is the second of two similar medals awarded to men who entered a theatre of war in the early part of WW1. 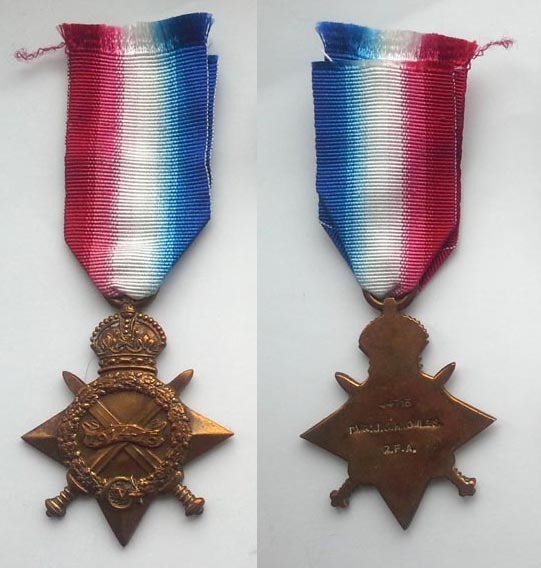 Any man who entered a theatre of war before midnight on 22 November 1914 was entitled to the 1914 Star, and if he actually served under fire he could add a clasp reading "5 Aug. to 22 Nov. 1914" or a small silver rose to his medal ribbon when not wearing his medal. Men who served from 23 November to 31 December 1915 were entitled to the 1914/15 Star. They actually had to set foot on land in a Theatre of War, hence why the Barnsley Pals, who set sail from England in December 1915, but who did not get to Egypt until January 1916 and France until March 1916, are not entitled to either Star. When a Star was worn with the British War Medal and Victory Medal the trio were often known as "Pip, Squeak and Wilfred" after more cartoon characters of the time. My medal belonged to John J Knowles who arrived in France, according to his Medal Card on Ancestry (free to search and view images throughout the WW1 centenary period), on 26 August 1915, with the Royal Field Artillery. He was, of course, also entitled to the British War Medal and Victory Medal, but there was no sign of them in the cabinet in Elsecar. A search of the 1911 census suggests that the number of John Joseph or John J, or even JJ Knowles men of around the right age to serve in WW1 runs into double figures, and I have no other information about him. 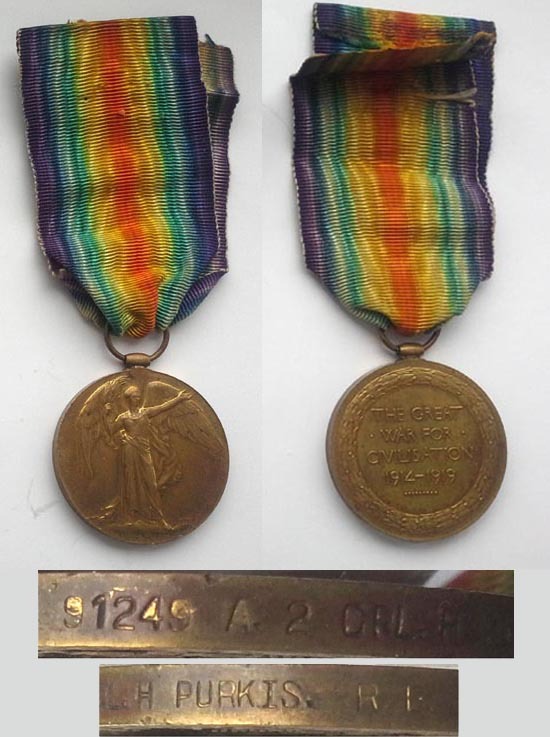 Again I have added this image to his page on Lives of the First World War and I hope that and this blog post will, somehow, sometime, result in family members finding out what happened to his medal. 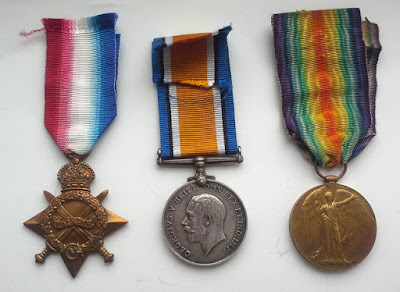 I know lots of people have medals or collect medals - if everyone added their pictures to a central repository like Lives of the First World War we might be able to find our more about our First World War soldiers, get in contact with relatives and Remember their service to us together.